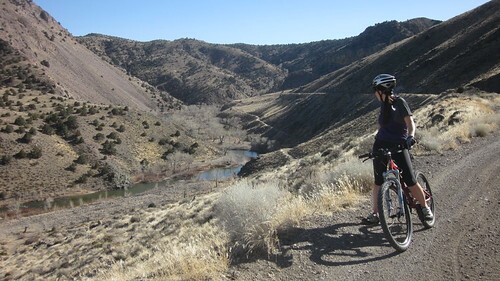 It had been a long time since I’d been through the Carson River Canyon. 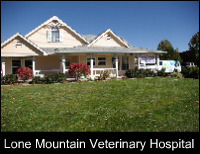 It doesn’t have the best reputation in town, making the news in recent years as the location of an attempted homicide, an accidental homicide, and as a place where a body was found. 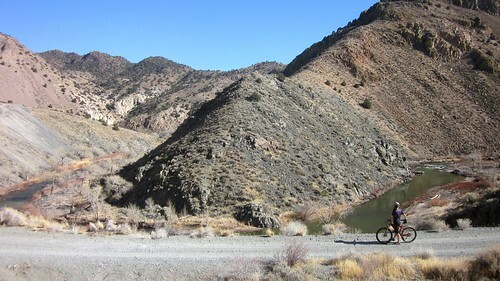 It’s also a popular place for firearm testing, motorized OHV use, dumping trash, and graffiti, all activities that don’t necessarily conjure up feelings of solitude and getting away from it all. In spite of all this, the river canyon had been on my mind, and I was ready to give it another chance. 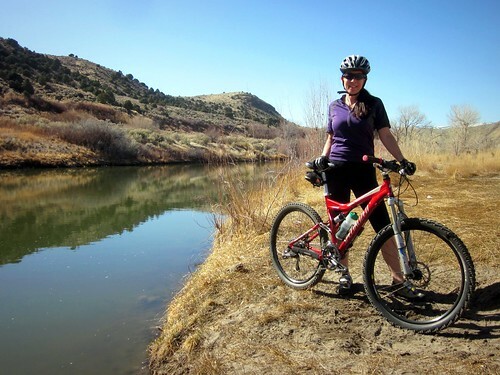 To begin our adventure, my wife and I shuttled our bikes to the parking area by the Carson River Bridge on Deer Run Road, just south of Highway 50. 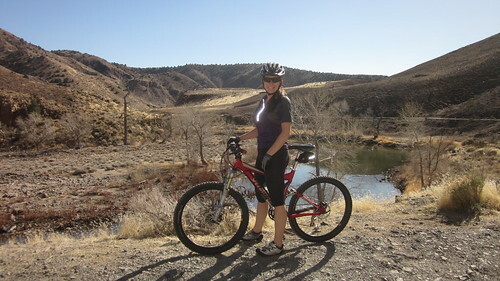 From here, the ride starts off down a wide graded road that follows the river to the east into the Carson River Canyon. Shortly after the river bends to the south, you will arrive at an intersection by the gravel plant. There’s an old dilapidated bridge here that used to cross the river and provide access to Brunswick Canyon, but it us unusable and fenced off. Flood waters have eroded the banks around the bridge, and there are holes and missing sections in the decaying timber. 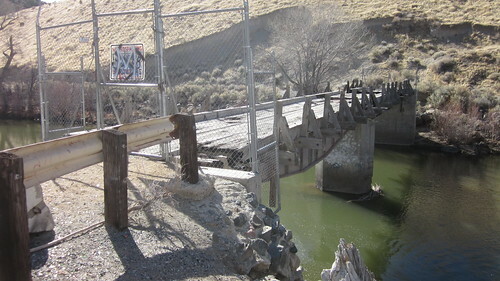 It’s a bridge better suited for the set of an Indiana Jones movie. If you’re looking to gain access to Brunswick Canyon, you can go back to Deer Run Road, head south, then cross over the hills at Sedge Road. As you leave the bridge and gravel plant behind, the river and the road bend south. The wide graded road becomes more narrow and less maintained. While the terrain and grade are still easy, the road is pretty bumpy in places. 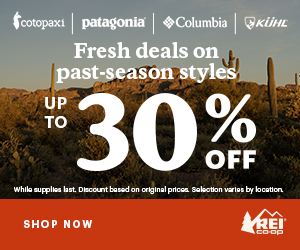 Suspension or wide low pressure tires will add to your enjoyment for the remainder of the trail. It’s a bit slow going at times, but this actually works out pretty good, because there’s a lot to look at and enjoy. Just before the road goes through a narrow gap and turns to the north, there is a nice river access point for photos. Just across the river is an interesting side canyon, what looks to be a spring, and the foundation of some long gone structure. 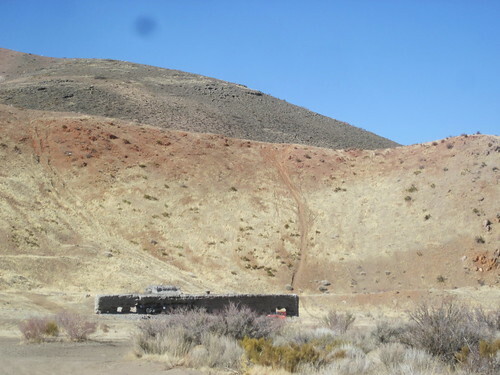 In a nearby hillside, there is what looks like a tunnel, but it doesn’t go too far back. You have to use your imagination to picture what it may have looked like along the river when the mills and train were in their heyday. Unfortunately though, this location has the most litter along the trail. Be sure to watch out for nails and broken glass. As we enjoyed our break along the river, we watched six people crawl by in what appeared to be an amphibious ATV. They cruised around the network of roads, but to my disappointment, never made an excursion into the river. Now that would’ve been entertaining! Part of the reason we took an extended break is because of all the gunfire coming from just over the hill. The way the shots were echoing throughout the canyon made it sound like a war zone. At the rate the guy was firing, it was my hope he’d soon run out of ammo, but apparently he had brought plenty. We decided to proceed along the road with caution. Just past the narrow gap, the road heads to the northeast along the river, and past the site of an old mill from the mining days. Not much is left of the mill site except for a small, bullet riddled concrete structure. This is where most of the target shooting occurs along the route. The acoustics of this bowl shaped area along with the twisty canyon probably make the sounds of gunfire worse than they really are. Still, we didn’t feel like hanging around here, and we made our way around the next bend quickly. Just past the mill, we encountered an area that was recently burned, revealing all the litter that would normally be hidden by grasses and bushes. Broken glass from hundreds if not not thousands of broken bottles sparkled in the sun all along the hillside. It was a sad site to see, and I can’t imagine the time, effort, and total disregard for the environment it took to accomplish such a mess. I’m not sure how you would even clean it up without sifting the whole hillside. Fortunately, the litter became less frequent as we pedaled on, and the sounds of blasting gunfire diminished. 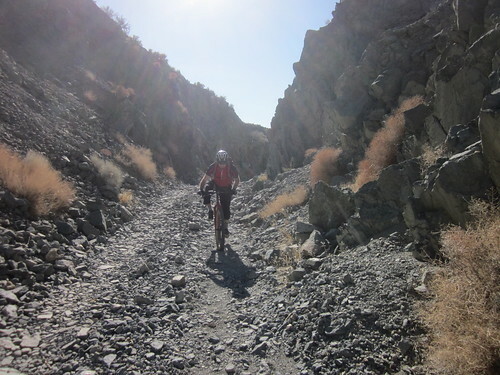 This section feels more remote, and the terrain and scenery get more dramatic. The canyon walls become steeper and narrower. 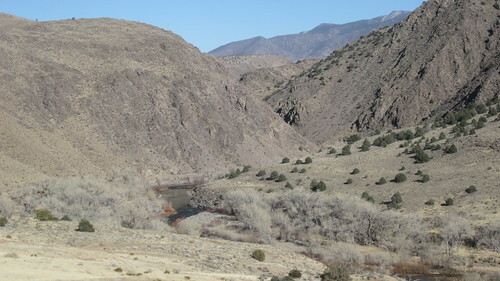 Many smaller canyons enter the river canyon from the side. Huge rock formations with green lichen on the northern faces cover the hills. The road gently climbs up and away from the river, and soon you are looking down on the river from pretty high up. There are a few steep exposures in places along the narrow road, so keep your eyes on the trail. The views are exceptional, and make the journey into the canyon all worth while. 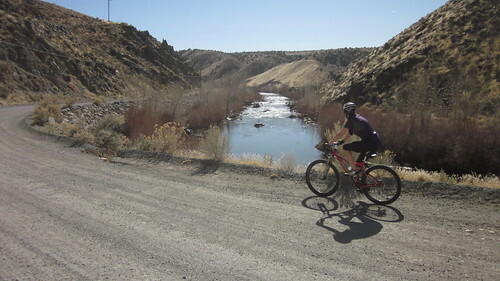 Even though the main road is high above the river at this point, there are a few side roads that go down to the bottom of the river canyon. It looks like it would be a nice place to picnic or cool off in the summer among the cottonwoods. This wasn’t the day for picnicking or relaxing below though, as there was a guy blasting away with a large pistol down below us. 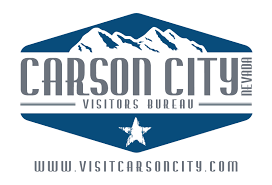 I’m not against responsible target shooting, but as more people begin to use the river canyon, and if we hope to attract more out of town visitors, we’re going to have to move the “shooting ranges” somewhere safer nearby. Already there seems to be too much potential for accidents with all the visitors to the canyon and the stealthy modes of travel like rafting, hiking, and cycling. At the very least, the reverberating booms in the canyon are pretty intimidating, and it’s hard to tell where the shooters are. 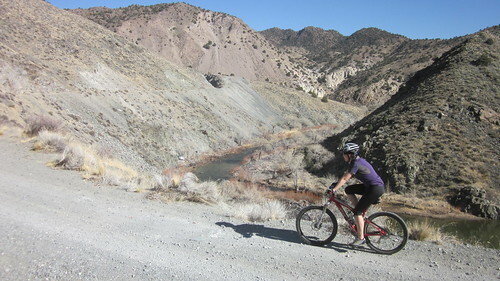 We came to the end of the line above Santiago Canyon where it meets the Carson River Canyon. It’s not that you can’t proceed further from here, but the tracks from the V&T Railroad project end here. Further progress along the tracks would be ill advised, since there would be no place to escape in the narrow passes if the train happened to come along. 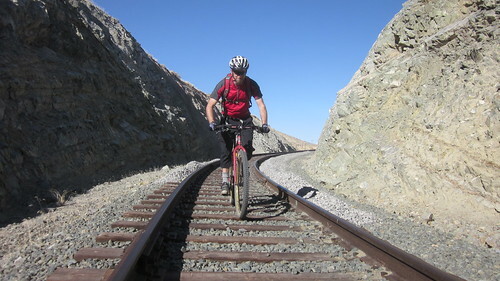 A mountain bike will always lose in a collision with a steam locomotive. There is an alternate way around the tracks, but you’ll loose elevation going down into Santiago Canyon before having to climb back up to Mound House. For our ride, we just turned around and retraced our route. Although we barely noticed the gentle climb on the way out, there was much coasting to be enjoyed on the way back to the trailhead. 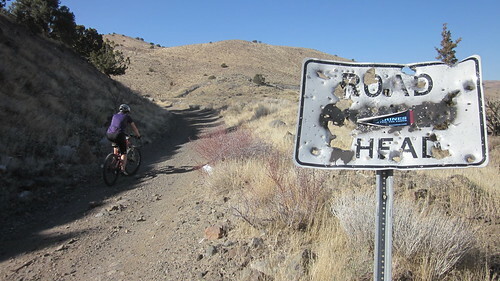 Despite the litter and the gunfire, the Carson River Canyon turned out to be a great ride. We encountered several other trail users along the way, trucks, ATVs, and other mountain bikers. Everyone was friendly, courteous, and shared the trail just fine. 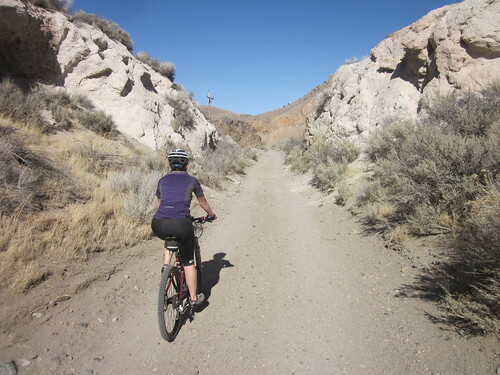 At just around 10 miles out and back, and with very little climbing, it’s a good trail for beginners or those just looking for an easy ride with fantastic scenery. Although the canyon has been neglected for a long time, this appears to be turning around. A new gate has been installed at Deer Run Road, and I hear it is closed at night. The city and public seem to have a renewed interest in the canyon, realizing its beauty and recreation potential. The Carson City Aquatic Park currently uses the canyon, and the V&T Railroad project plans to keep extending the tracks up the canyon. 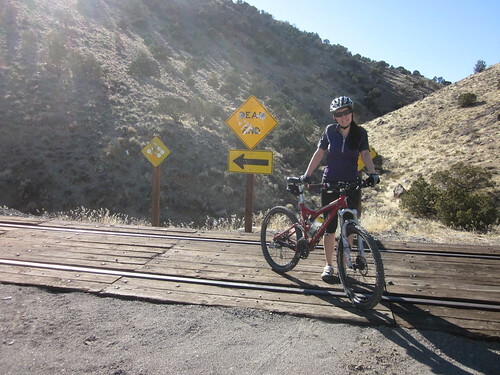 Although the train plans to utilize the old bed that this trail is on, it has been said at city meetings that there will be a non-motorized recreational path for river canyon access. It’s not clear to me where the trail would be though, as there is a lot of steep and rugged terrain surrounding the current trail, and there is not enough room alongside where the tracks will be. 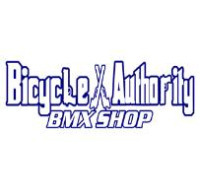 I’ll follow up on the plans for the new multi-use trail, and report back to you. Where will the path go when the tracks are complete? About 10 miles out and back. Easy grade along an old railroad bed with very little climbing or descending. Road is bumpy and rocky in places. Suspension or wide low pressure tires recommended. 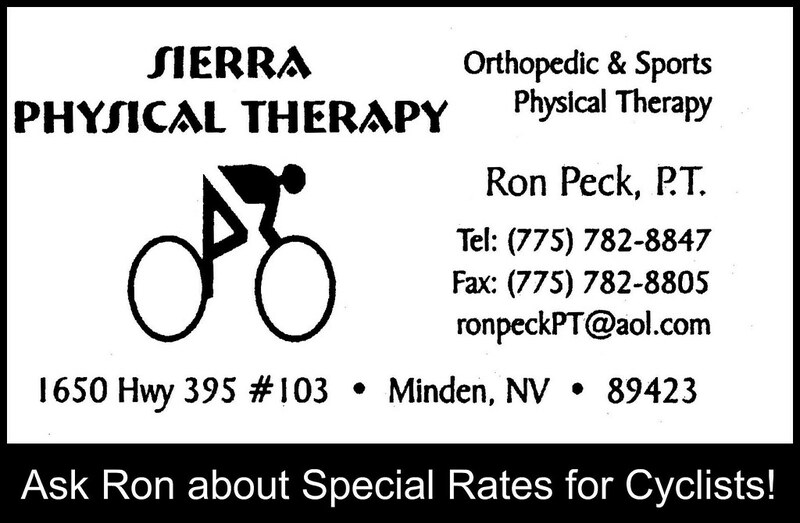 Potential to connect to the old toll roads that lead to Virginia City for longer rides. Great article, Jeff. I miss the place. I’ve ridden my Brompton on the same route, as well as downriver further, but it was really too rough for that kind of bike. Many, many hikes there, all enjoyable. I too wonder how bike/walk access is going to be maintained when the tracks get extended west up the canyon. I’m looking forward to exploring down river more. It’d be fun to look for more remnants of the mill and railroad. I second the great write-up comment above! Might be a great ride for my wife.